Dress up your workaday style with this striped four pocket vest. Constructed of durable cotton twill, this 1800's style vest features a straight cut waist, four pocket front, adjustable back, and riveted buttons. Part of our matched Ferndale collection. Imported. 100% cotton, self backed. Machine wash cold, hang to dry or tumble dry low. Available in sizes S - 3X. I already had the pants but now I needed the vest. They were out of stock on the mediums so I had to get a large & take it in. I'll def check availability. Great quality! A Dandy of a Vest! Bought this and the matching Ferndale Striped spats to complete my patent medicine salesman 'living history' persona and am 1000% pleased with the fit and appearance. Both items look great in the website photos but are even more impressive in person. Really liked the higher neckline on this vest and the 4 pockets in front are perfect for everything from my pocket watch to a small bottle of 'cure all'. Thanks Historical Emporium for offering such great merchandise! I ordered the whole suit; Frock coat, pants, vest and spats. Great quality. I'm 6'2" 215lbs and the XLs are a little on the large size, but I'll be getting them tailored. Not sure if the large would have done it, so not a big issue. LOOKS GREAT. Good weight to the fabric. This is really one good looking vest! I have quite a few of your vests and am delighted with all of them. I'm a very big vest fan; don't consider myself fully dressed without one. This is the first striped vest I've bought and it certainly won't be the last. Congrats for a terrific product! I love the vest. Just want to mention that the navy stripes look black. The vest was arrived very fast, the hubby loved it. The quality is great and fits like a dream. Beautiful vest. Just what I was looking for. Fast shipping and great service. Will be back again and again, I'm sure. I ordered this along with the matching trousers and we pleased to see how well it fit and how well-made it was. I would definitely recommend this ensemble to anyone looking for durable non-costume period clothing. Seems great. Haven't tried to wash/clean it yet but the quality is nice. Trust the tape measure. I couldn't bring myself to order a size large as 100% of my wardrobe is XL. Ended up having to exchange it. I think I could have even fit a medium. Trust the tape measure procedure they give you. Also, go a size up on the pants as suggested. The Ferndale combo looks pretty sweet. Your ferndale vest is good value for the money! Thank you,nice job! This vest fits me like it was tailored to my frame just for me by a master tailor. The pockets are really cool an in the right spots for my pocket watch and pocket knife. Looks better in person then on the computer and when matched with the trousers, 100 % awesome. 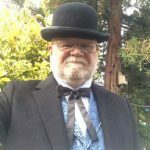 Formal when wearing my Frock coat and top hat or switch hats to a bowler for a more semi formal look. A really nice addition to my suit. An excellent vest. A lot of reviews of the vests here were saying they ran big, so I ordered a smaller one than I would have otherwise. Turned out to be a bit too small, but the replacement I ordered fit perfectly and arrived a whole lot faster than I anticipated. Looks great with my Steampunk outfit I put together.